Soft Landing Missoula was formed with the mission of helping Missoula to be a welcoming, supportive, and informed community that can assist refugees to integrate and thrive. In this time, we have been strongly uplifted and supported by the incredible Missoula community. We have now created a visual way to celebrate Missoula’s commitment to a welcoming community for all and proclaim loud and clear what you have taught us- that Together, We are Missoula. What is the sign campaign? 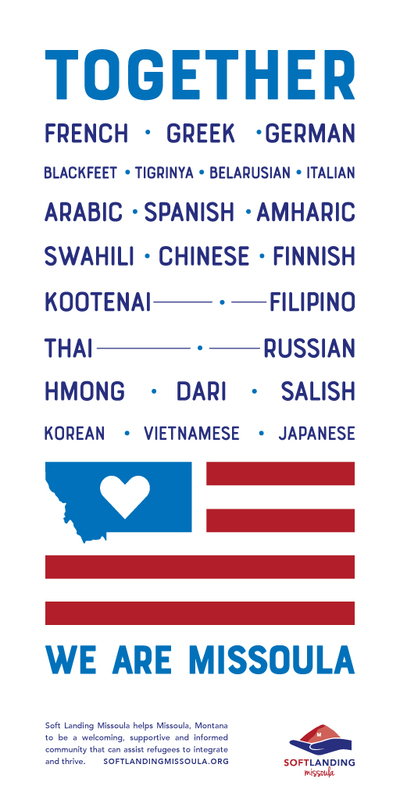 Our “Together, We Are Missoula” sign campaign encompasses 24 languages, notably including three languages of people native to this region. We will use yard signs, window clings, stickers, downtown banners, public art spaces and even a specially designed beer can to proclaim a message of unity across lines of country of origin, culture, and language for neighbors both new and old. We join the growing number of communities who recognize that being a welcoming community for all makes us stronger economically, socially, and culturally. It will be the first large public display of the values of Soft Landing since we organized a march in March 2016 that was attended by over 1,000 people. With this city-wide campaign, endorsed by the City of Missoula, we will show that Missoula is the kind of place where diverse people feel valued and want to put down roots. We ask that people join with us in embracing the unity in community and exclaiming that Together, We Are Missoula! When you give $25 or more or if you sign up to become a recurring donor, you will receive a gift of a sign package OR a limited edition t-shirt. The sign package includes a "TOGETHER We are Missoula" yard sign, car magnet, and sticker. Oh, you don't speak all 24 of the languages on the sign? Don't worry, we have a cheat sheet for you!